In the last post, I noted that the hero rarely gets what they originally wanted in a profoundly moving film ending. Here we explore what they get instead – the Ecstasy that is the counterpoint to the Agony. 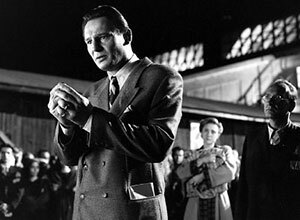 In Schindler’s List, Oskar wants pots of money, but leaves penniless. In Tootsie, Michael Dorsey wants an acting job, but ends unemployed. In Casablanca, Rick wants Ilsa, but has to let her go. In a lot of the great films, the hero/protagonist does not get what they set out to get. So, that’s the Agony. What is the Ecstasy they receive to compensate for losing out on the “prize”? What do they get that will allow the audience to walk back out into the world feeling satisfied? What is the Elixir that Joseph Campbell and Chris Vogler talked about? Producer Lindsey Doran makes the point that in films we tend to respond not to the hero getting the prize, or the money, or the promotion. What we really value as human beings are relationships. Love – in its many forms. Romantic love. Familial Love. Love between friends. Love between people who, by rights, should be sworn enemies. Audiences value seeing expressions of love because in life that is the feeling we cherish above all else. So what does the hero get if they don’t get what they set out to get? They often tend to get love. In Schindler’s List, Oscar leaves with just the (striped concentration camp) shirt on his back but gets the love of his workers, and of the generations who come to live because of his actions. In Tootsie, Michael Dorsey gets the love of Julie (Jessica Lange), who is likely to be a better match for him than her father, Les (Charles Durning). Why does this work for us? Because we know it’s true. Most of us would say – most adults at least – that love is the most precious thing in our lives. For some of us that is the love of our partners. For others, this form of love can be a little problematic. But, even if romantic love has proven elusive, then most of us will value the love of our friends, or our parents, or our siblings or our children. Life without love, no matter how successful the world might perceive us, is pretty empty. Since we know life, ultimately, is about relationships, it makes perfect sense that this internal pleasure will nourish the audience more than any outward accomplishment and explains why it’s so often an element of the great movie endings.